The world of alternative browsers is littered with also-rans like Rockmelt, but there are also companies that have managed to make a name for themselves in the shadow of Microsoft, Mozilla and Google. One example of this is Maxthon, but another browser that’s quietly gaining a following is Torch, which the company tells us just passed 10 million monthly active users on Mac and Windows after about year on the market. Torch just launched the latest version of its Chromium-based browser, which now includes a download accelerator and a large update to the Torch Music service, which uses YouTube and Vevo as the basis of its music catalog. 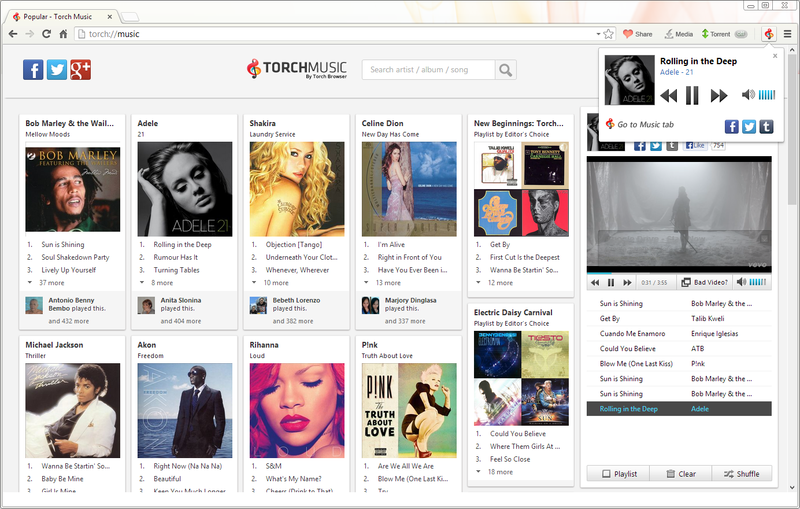 Torch Music now offers customized recommendations based on your listening history, location and your Facebook friends’ tastes. Currently, the service has about 5 million songs in its database. While Torch previously included a version of this service, it has now integrated this service deeper into its user interface with the help of a widget that allows you to search, pause and skip songs. Torch now also features a built-in download accelerator. While download accelerators were very popular in the early days of (slow) broadband, today’s fast and stable connections have mostly pushed them aside, and the vast majority of Internet users probably doesn’t even remember them. There are some advantages to using a download accelerator, however, especially if you are on a slow or unreliable connection. The browser also features a built-in BitTorrent client and a media grabber for downloading embedded video files. It also features a smart drag-and-drop-activated search and sharing tool that pops up large boxes for sharing links to services like Facebook, Google+, Twitter and Pinterest and for initiating searches on Google Search, Wikipedia and other services. Torch Browser only launched on the Mac about a month ago, so most of its users are currently on Windows, the company tells us. If you’re currently a Chrome user and interested in the browser’s features, switching is about as easy as it gets, as Torch just imports all your bookmarks. As it’s based on Chromium, all of the usual Chrome extensions and apps should also work, though Torch seems to be about a generation behind Google’s own release cycle.